We now leave the world of Birkeland. 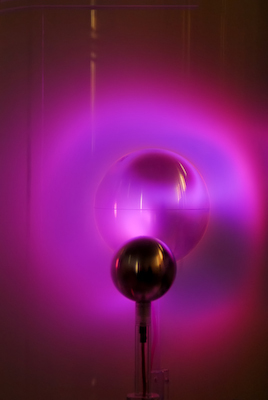 The large sphere is connected to the négative pole of the generator and emits electricity. It thus becomes a star. The small sphere, or eventually the nozzle is connected to the positive electric pole of the generator and represents is a planet. If the small sphere is a planet, the auroral ovals are clearly visible. We concentrate on our star. The electrons are emitted over the whole surface, but are repelled from the magnetic poles themselves. Away from the sphere, they excite and ionize the surrounding gas, which emits light by returning to the ground state: the light in the Planeterrella allows to trace the path of the electrons. These expand in the chamber, and draw what we call, for the sun or the stars, a corona in expansion. Over the magnetic poles, the absence of light is a "coronal hole", widely observed by various satellites in the case of the Sun. I often think that with a Planeterrella, K. Birkeland could have discovered the expansion of the solar corona and coronal holes ways before the space age. 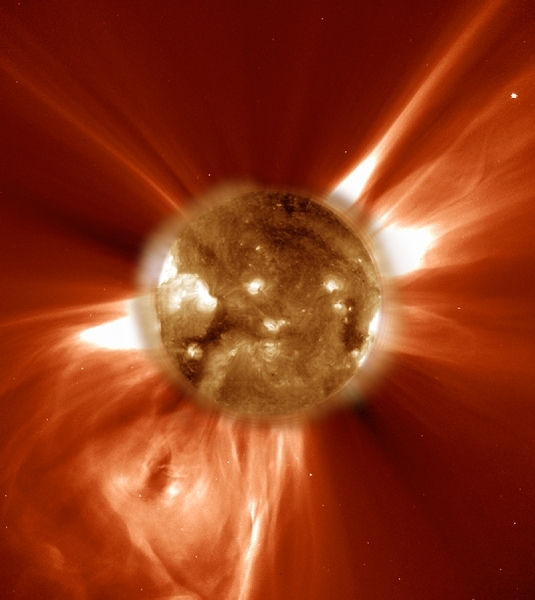 There are many pictures of the solar corona and of the coronal holes. On the web, you will find some on the sites of Yokhoh, Trace... The most spectacular are those the new satellite stereo. But I have a weakness for the beautiful photographs of SOHO satellite ESA – NASA, which has contributed so much to our knowledge since its launch in 1995.